Lifeguards, attendants, hours of operation — the task of determining exactly how the swimming pool in Seven Lakes will operate this coming swim season has been delegated to the Recreation Committee. During the Board's Thursday, January 28 Work Session, Seven Lakes Landowners Association [SLLA] President Chuck Leach asked the committee to come up with a revision to Rules 9.1.7, 9, 10, and 11. From the use of flotation devices to the authorization of pool games, those rules all deal with the authority of lifeguards to manage the pool. Leach asked the committee to develop rules for the diving board, a parental and child liability signature form, and a job description for pool assistants. He and the Community Manager would develop the schedule and salary for pool assistants, he said. The Board would determine penalties for those who do not follow the rules, he added. Whether this year's pool operations will continue to include lifeguards remains an open question. The Board voted during the January 14 Open Meeting to eliminate the one rule that requires them. But public sentiment in the meeting was strongly in favor of continuing to have lifeguards for at least part of the season and part of the day. Depending on which members were in attendance at their meetings, the Recreation Committee has in the past voted both to eliminate lifeguards and to retain them for part of the day. The Recreation Committee next meets on Monday, February 8 at 4:00 pm at the Landowners Office. Its recommendations are due back to the Board at the Thursday, February 25 Work Session. John (JD) Zumwalt doesn't come across as a politician — and he'd be the first person to admit that. In fact, even though he's running for the District 52 seat in the North Carolina House of Representatives, politics — at least politics as usual — is exactly what he's running against. "I'm just fed up with the establishment," he told The Times, in an interview on Monday, January 11. "And I thought it was just DC, until I started doing my research, and I realized that's it's not just DC. It's in Raleigh as well. And is documentable — it's shockingly in your face, if you go looking for it. And I can't believe that we keep electing the same people." Zumwalt came to Moore County, like many residents, courtesy of Ft. Bragg. He was born and raised in East Texas, near Corpus Christi. A Vietnam vet, he worked as a policeman, firefighter, and ambulance driver. He became a tugboat pilot and then a fire boat pilot before returning to the military after a 16-year hiatus. He served with the Army Rangers for three years, completed Green Beret training, and served with the Fifth Special Forces Group out of Ft. Campbell, KY for seven years. He then moved to US Army Special Operations Command at Ft. Bragg. He retired in 2004 while serving in Iraq and began to work with the Army's IED Field Team and eventually with the US Army Asymmetric Warfare Group. 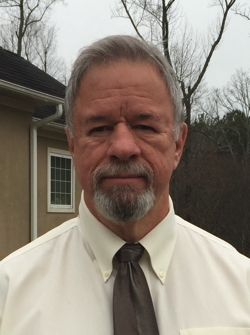 The District 52 seat is currently occupied by Republican Jamie Boles, who is seeking re-election to his fifth two-year term. Zumwalt is careful to note the he's is not running against "Mr. Jamie Boles." "He's a good man, and people like him," he said. "I'm running against Representative Jamie Boles, because he's not a good legislator for the people." Zumwalt begins his case against Rep. Boles with an expansion of the sales tax approved by the General Assembly as part of the FY2016 state budget. The state broadened the categories of business subject to the sales tax to include some services, like auto and appliance repair. The expansion takes effect in March. "Small business owners cannot afford that," Zumwalt said. "Some of them have mark-ups as low as eight percent, and they tell me they just can't afford this new tax." "Second, it was rammed down our throats quietly," he said. "Most folks didn't even know it was happening." "But the most important thing — and this drives me crazy — is that we cannot spend one dime of that money in Moore County. It all goes to other counties that the legislature has deemed to be more in need than we are." The General Assembly in fact selected 79 of the state's 100 counties and divided the anticipated additional revenue of $84.8 million among them. Moore County was not one of the 79, though every county that touches Moore was included in the distribution. "My opponent voted for that," he said. "What I hear people saying is that it was going to pass anyway, so it didn't matter what he did." "Here's my analogy: If I hear someone's going to come to my house and hurt my family, and maybe four or five show up, I'm not going to stand by and do nothing. I'm going to fight tooth and nail to the very end for them." "And that's what I want to see my legislator do for me: fight tooth and nail. Whether he can win or not, I want to hear his voice being spoken, and I want him to vote no on these things." When I first moved back to North Carolina, in 1995, the Presidential election campaign that would pit and incumbent Bill Clinton against Bob Dole and Ross Perot was just heating up. At that point, I had lived in — and voted in — a half-dozen states, from Massachusetts to New Mexico. So I was aware that the rules about voting — and particularly about voting in Primary Elections, varied substantially for state to state. The Democratic Primary that year was pretty tame. After all, not many folks want to take on a sitting President. By contrast, the Republican race was pretty interesting, including, among others, Dole, Pat Buchanan, Phil Gramm, Pete Wilson, and a former Governor of the state I had just come from: Lamar Alexander of Tennessee. I had a lot of respect for Lamar, which is what everyone in Tennessee called him. After all, he had famously donned a red and black flannel shirt and walked all the way across the state during his first gubernatorial campaign. And he was an exemplar of an increasingly rare species: a moderate, pragmatic Republican. Though my voting track record up to that point had leaned toward Democrats, I thought I might want to vote for Lamar — at the very least, to make sure that we had two moderates, and not a flame thrower like Buchanan, on the ballot in November. To my delight, I discovered that, in my new state of North Carolina, I could register "Unaffiliated" and, when Primary day rolled around, vote in either party's primary. So that's what I did. Marge & Hal Blake sent us timely letter to the editor that, unfortunately, didn't make it in time for our January 8 edition. They agree with The Times that the SLLA Board should delay its pending decision on removing lifeguards until February, in order to gather more input. Our take: Just how risky are those diving boards? "U.S. Kids Have More Than 6,500 Diving Injuries Per Year." "Diving injuries estimated at 6,500 kids per year." Those were the headlines prompted by a 2008 study published in Pediatrics magazine — the first that used data from the National Electronic Injury Surveillance System. 6,500 kids a year landing in the emergency room because of a diving-related injury. That's a statistic that will make you sit up and take notice. And it did make Chuck Leach, President of the Seven Lakes Landowners Association [SLLA], sit up and take notice. "They're dangerous. There's no question," Leach told Board members during their December 17 Work Session. "You read this kind of data . . . it just seems to me that we've got to remove those diving boards." And, based on that reaction to the data, the Board plans to vote, during its Thursday, January 14 Work Session, on whether to eliminate the higher of the two diving boards at the Northside pool. But is that a correct reaction to the data? Is the risk really all that great? It's unfortunate when any child is injured, of course. But, beyond that, what does this study tell us about the risks associated with diving boards? According to the study's authors, all associated with either Ohio State University and its college of Medicine or Nationwide Children's Hospital in Columbus, OH, the average annual injury rate represented by those 6,500 emergency room visits is 8.4 injuries per 100,000 children under the age of 19. What does that mean for Seven Lakes? According to the US Census bureau, Seven Lakes had an estimated 1,066 residents under the age of 19 in 2014. If we do a little math we’ll discover that 8.4 to 100,000 is the same as 0.09 to 1,066. In other words, the expected average annual injury rate for Seven Lakes kids using the diving board would be 0.09. That's nine-hundredths of a child injured in a given year. That's kind of hard to visualize, so let's turn it into something we can understand. What that 0.09 child injured per year means is that we could expect one injury that might land a kid in the emergency room every eleven years. One injury every eleven years. Read more: Our take: Just how risky are those diving boards? 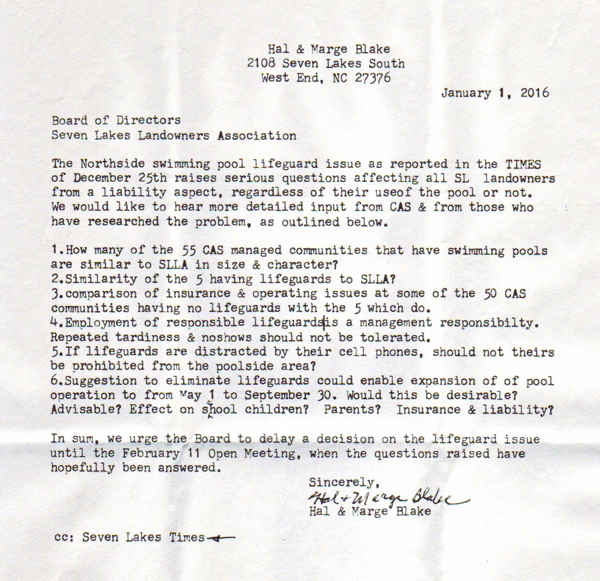 The Seven Lakes Landowners Association [SLLA] Board is poised to eliminate lifeguards at the Northside swimming pool — and remove at least one of the diving boards — in votes scheduled for the January 14 Open Meeting. Director Bob Racine made motions during the Board’s Thursday, December 17 Work Session to move both proposals to the Open Meeting and won the unanimous support of his fellow Board members. President Chuck Leach introduced the idea of eliminating lifeguards, arguing that they increase the Association’s liability, are difficult to manage, and reduce the number of hours the pool can be open. Leach recalled that then-SLLA-President Bob Darr had introduced the idea of eliminating lifeguards four years ago, during Leach’s first year on the Board. “I voted against it,” Leach said, adding that he was relying on his gut reaction. 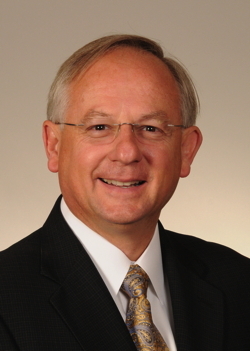 Since that time, he has done significant research into the pros and cons, Leach said, speaking with Jon Stone, the President of CAS, Inc. (the SLLA management company), the managers of other CAS communities, and the Association’s insurance broker, as well as studying up on the liability issues. Lawsuits involving alleged negligence by lifeguards often go against the company or Association that employs them, Leach said, and the awards often exceed the maximum coverage of Association liability insurance policies. The Association’s attorney indicated that in no case has a North Carolina landowners association been found to have a duty to employ lifeguards. Of the fifty-five CAS communities that have swimming pools, only five employ lifeguards, Leach said. The Association’s insurance broker indicated that the trend is moving away from having lifeguards. Leach said SLLA lifeguards are frequently distracted by their cellphones, are late to work, and sometimes don’t show at all. Most are students, and, when they began to return to school in late Summer, it is sometimes impossible to open the pool because there are no lifeguards. It requires thirteen lifeguards to fully man the SLLA pool. A prime advantage eliminating lifeguards, Leach said, is that it will allow pool hours and the pool season to be extended. He suggested that the pool could be open from May 1 to September 30, operating from 6:30 am to 9:00 pm on some days. Will the swimming pool in Seven Lakes North lose its lifeguards this Summer? We believe eliminating lifeguards would be a mistake, and urge Board Members to vote against any motion that would do so. More importantly, we believe the Board should delay its decision until the February 11 Open Meeting, in order to allow ample time for public input on this important decision — especially input from families with children. 1. Lots of other communities and hotels have gotten rid of lifeguards. 3. Lifeguards are a liability. 4. Lifeguards reduce the number of hours the pool can be open. 5. Parents should watch their kids instead of relying on lifeguards. 6. Lifeguards don’t do their job and are just texting instead. Let’s look at those, in reverse order.